Hand the deck to a spectator on your right. Instruct her to go through the cards, remove the ace of spades, and place it on the table. Turn to the spectator on your right and have her verify that there are no other aces of spades in the deck. Push the tabled ace of spades over to a spectator on your left. 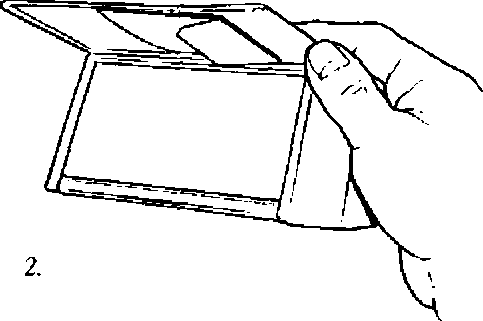 Open the wallet to the side containing the unsealed envelope and place the deck aside face up. (If you were to place it face down there is a risk that the top card might spread, revealing a reversed card.) Hand the envelope to the spectator on your left. Instruct her to place the ace of spades inside and seal it. When she has done so, take the envelope, and place it back in the wallet, flap side upward. 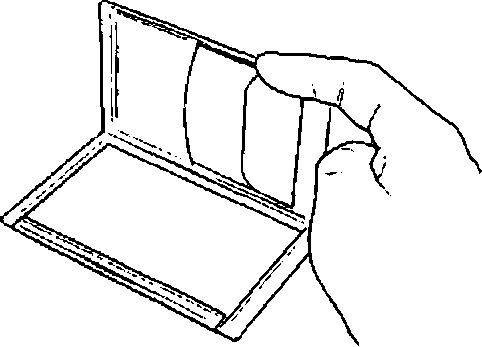 (This should look identical to the orientation of the duplicate envelope in the other compartment.) 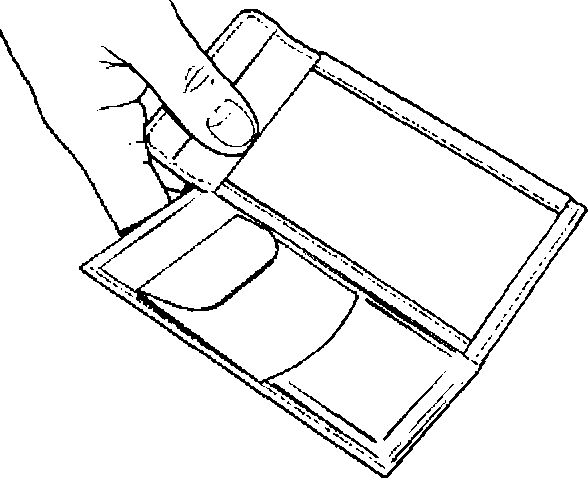 Hold the wallet open in your right hand as shown in illustration I. 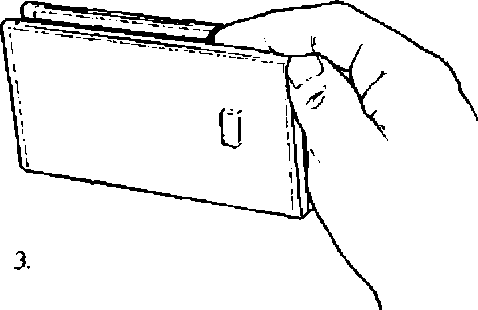 Note the position of the first finger and how the hinge of the wallet falls between your first and second fingers. Reach into your pocket with your left hand and remove the pen. As you do so, you're going to secretly close the Himber wallet and open it to the other side. Your right hand drops to the table and turns palm down. At the same time, your forefinger flips the wallet shut. Your thumb then catches the inner hinge oi the wallet and pulls it open. Illustrations 2. 3, and 4 show these actions in progress. All of this should be done with the back of your hand to the audience and with all your attention on removing the pen. By the time the audience's attention returns to the wallet, everything looks the same. wallet and place it in front of the spectator on your left, instructing her to place her hand on it. Each time the spectator touches a card, place it face up on the table, forming an overlapping row. You must, of course, make sure that she makes her choices before you reach the slug of reversed cards. This requires only minimal audience management skills. Take the deck face down in left-hand dealing grip. 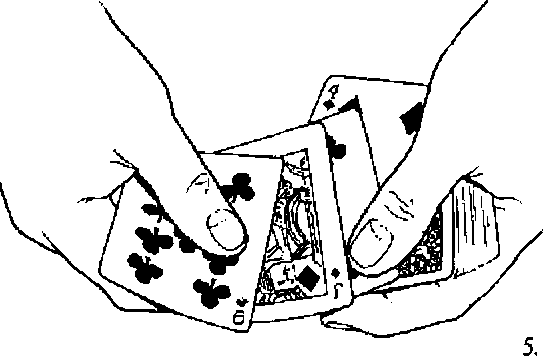 Obtain a fourth-finger break under the top five cards by means of a pinky count. Scoop the four face-up tabled cards onto the deck. Spread them between your hands as you stress that there i6 not an ace or a spade among them. oif of all the cards ahove the break. The position of your thumb will hide any slight misalignment of the block along the left edge while the other cards will hide any misalignment along the right edge or the front. (This is evident in illustration 5.) As soon as the cards are square along the sides, flip them face down onto the deck. Spread the top four cards and take them into your right hand. (These are the four duplicate aces of spades, but the audience believes them to be the four freely selected cards.) Drop them in a row on the table in front of the spectator on your right. Mix the four cards around a bit (the way the shells are usually mixed in the Shell Game) so the audience doesn't know which card is which. Throughout this and all subsequent actions, retain the deck in your hand. Explain to the spectator that you want her to eliminate one of the cards. Whichever card she points to, pull it back toward you. Have her repeat the process until there is only one card in front of her. Be very clear that she is eliminating cards, not selecting cards. You don't want the spectator to suspect any kind of equivocation; since the selection process is totally fair, you may as well get credit for it. Indeed, the only purpose of the one-by-one elimination is to dramatize the fairness. Finish by giving the spectator the option of exchanging her one remaining card for any of the three she rejected. 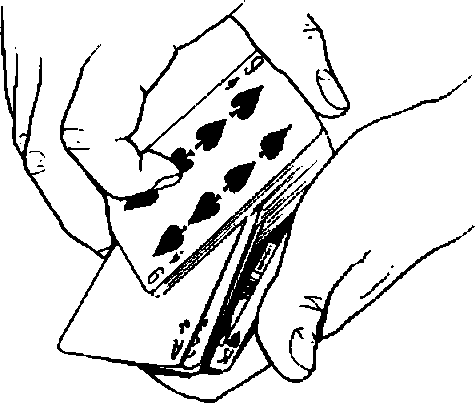 At some point during the selection process, obtain a fourth-finger break under the top four cards. Once the spectator has conclusively settled on a card, have her cover it with her hand. The three remaining cards should be in an overlapping row in front of you. Scoop the three cards onto the deck and flip over all the cards above the break as before. Spread the three face-up cards, commenting about how the spectator could have chosen any of them. Insert each one face down into the deck. The double-backer will now be on top with three duplicate aces of spades face up under it. The fourth ace of spades is, of course, under the spectator's hand. Obtain a break under the top four cards. Take the envelope from the spectator and dramatically tear it to pieces. Make sure you demolish the envelope thoroughly enough that everyone can see that there can't possibly be anything hidden inside. Turn to the spectator on your right and have her lift her hand. Have her show the card she chose to everyone, revealing the vanished ace of spades. If you now add the ace of spades to the deck, you'll be left with an ordinary pack that you can use for any subsequent effects.